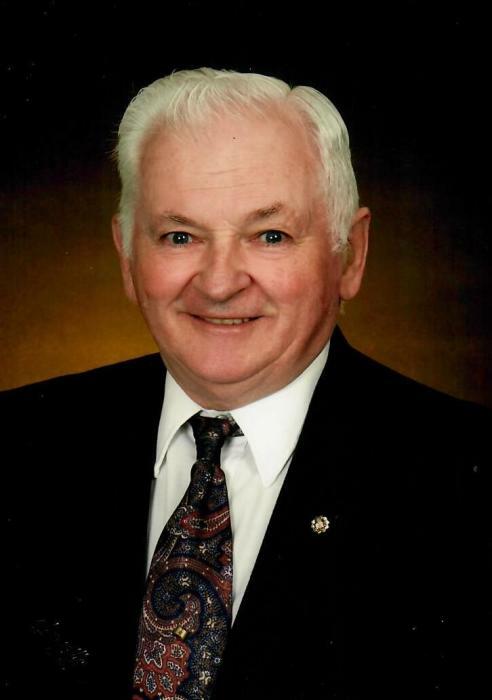 Obituary for Leon H. Reape | Iseneker Funeral Home, Inc.
LOWVILLE- Leon H. Reape, 82, of East State Street, Lowville, passed away on Tuesday, January 15, 2019 at his home. A funeral Mass will be said on Saturday, January 19, 2019 at 11:00 a.m.at St. Peter’s Catholic Church, Lowville with Rev. Jay Seymour, Pastor officiating. A luncheon in St. Peter’s Church Fellowship Hall will immediately follow the funeral Mass. Spring burial will be in Lowville Rural Cemetery. Calling hours are Friday, January 18, 2019 from 3:00 to 7:00 p.m. at Iseneker Funeral Home, Inc., Lowville. Contributions may be made to St. Peter’s Church, 5457 Shady Ave., Lowville, NY 13367 or Lowville Food Pantry, 7646 Forest Ave., Lowville, NY 13367 NY 13367. Surviving are his loving wife of over 56 years Janet; three children, Carl L. Reape of North Carolina, Julie A. Reape and Steve VerSchneider of Castorland, Julene M. (Michael) Fayle of Lowville; six grandchildren, Jacob Reape and Lacey, Katelyn (Dillon) Reitzel, Connor Fayle, Matthew Fayle, Daniel Fayle, Kurt VerSchneider, four great-grandchildren Tjaden Reape, Kain Reitzel, Addelyn Reitzel, and Lainey Reape; four brothers, Raymond (Karen) Reape of Castorland, Harvey Reape of Castorland, Thomas Reape of Castorland, and Francis Reape of Castorland, a brother-in-law Duane Kloster of Castorland; several nieces, nephews and cousins. He is predeceased by a son, Michael K. Reape who died on February 9, 1972; a sister, DiAnn Kloster, a sister-in-law Nancy Reape. Leon was born on March 26, 1936 in Lowville, NY, a son of the late Calistus L. and M. Edna (Rowsam) Reape and grew up on the Rector Road, attending a one-room school house and graduated from Lowville Academy & Central School in 1956. On October 20, 1962 he married Janet Abel at St. Ann’s Catholic Church, Castorland, NY with Rev. Flavin Colligan OFM officiating. Leon worked for the Lowville Producers milk station, Beaverite Products, Inc. and Climax Mfg. Co., Castorland, retiring from Bosie Cacade after several years. He was a communicant of the former St. Anne’s Catholic Church in Castorland where he was a member of the Holy Name Society. He was a communicant of St. Peter’s Catholic Church, Lowville where he was a Eucharistic minister for several years and brought Communion to the elderly. He was a 4th Degree member of the Knights of Columbus. He was a 4-H leader for many years. His hobbies included, reading, woodworking, history, hunting turkeys, deer, he enjoyed the woods and all wildlife. He was a member of the Fairchild Hunting Club and the Tug Hill Fish & Game Club. He was a lifetime member of the NRA. In his earlier years he enjoyed dancing—especially the Irish Clog. Most of all, he loved to camp with family and watch his grandsons playing sports. He was an avid fan of Lowville Academy sports and enjoyed watching all the games. Leon was a firm believer in helping anyone in need. All he asked in return was that they do the same for someone else in need. The door always remains open. If a stranger visits, they leave as a friend. Leon’s family and friends will forever miss his big smile and twinkling eyes.